Ursula Bastianz was named the winner of the Samsung Galaxy Grand Facebook Promo which was held recently. 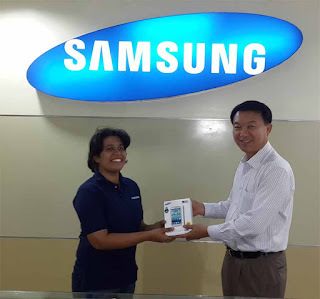 Samsung Electronics Sri Lanka conducted online Facebook promotion where they asked fans an array of questions about the product and requested that Facebook users post a picture of them holding a Samsung Grand and write in on why they deserved to win the phone. Three of the best responses were chosen every week to receive a Samsung branded Tshirt and cap; the final winner of the promotion walked away with a Samsung Galaxy Grand. Ursula Bastianzs’ winning response and pictures were also posted on the social network site – her winning response included “I want to win this mainly for my mum for our family”.